Watermelon Fuse Bombs are projectile items appearing in Donkey Kong Country: Tropical Freeze. As the name implies, they are explosive watermelons. The Kongs can pick one up and throw it like a Barrel at enemies to defeat them, or at certain obstacles to break them, usually to reveal a secret Bonus Area entrance or a Puzzle Piece. In these cases, the bomb would explode instantaneously; however, if the Kongs throw or drop it onto the ground, the fuse will continue to burn until it detonates by itself. If the Kongs are carrying or within range of the Watermelon Fuse Bomb when it explodes, they will lose one heart. A Watermelon Fuse Bomb first appears in an unlit state in Shipwreck Shore, where they will begin to ignite once the Kongs pick it up. Watermelon Fuse Bombs are also usually carried by Boom Birds, and used by Harolds as projectiles. Some Watermelon Fuse Bombs are also found underneath plugs in the ground. In the boss level Triple Trouble, Watermelon Fuse Bombs are used to defeat Ba-Boom. 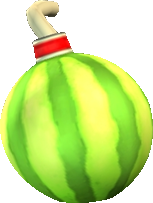 During the fight, Ba-Boom will also throw spiky bombs that resemble Watermelon Fuse Bombs, but they have a shorter fuse and cannot be picked up. In Sea Stack Attack, a special kind of Watermelon Fuse Bomb appears at the end of the level. This bomb grows in size as its fuse burns and kills the Kongs instantly upon exploding. This page was last edited on February 25, 2019, at 15:21.